Bohao Huang is a Ph.D. student in electrical and computer engineering at Duke’s Pratt School of Engineering. He is part of the Applied Machine Learning Lab at Duke and focuses on the translation of advanced machine learning techniques into practical solutions for challenging real-world problems. Specifically, Huang is developing algorithms to automatically extract useful energy systems information from large volumes of aerial imagery. 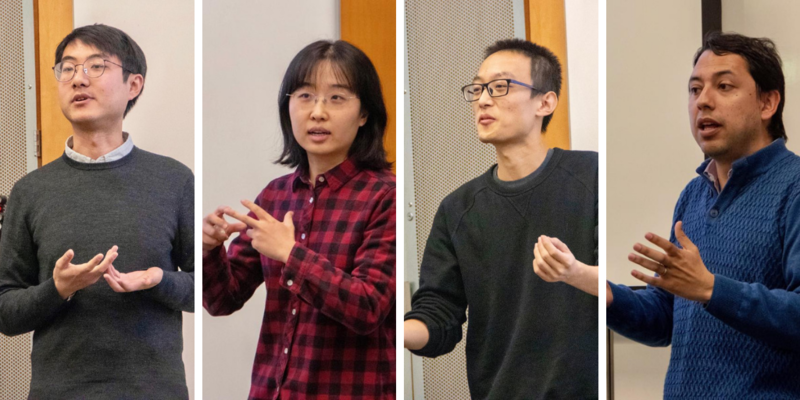 Qingran Li is a Ph.D. student in the University Program in Environmental Policy (economics track) offered jointly by Duke’s Nicholas School of the Environment and Sanford School of Public Policy. Her research includes using analytical tools to understand behavioral responses to policies and developing interdisciplinary solutions to energy and environmental issues. Li is using smart meter data and behavioral surveys to develop a new algorithm to better identify residential usage patterns and estimate demand more precisely. Edgar Virguez is a student in the doctoral program in environment at Duke’s Nicholas School of the Environment. He is interested in contributing to the understanding of market mechanisms that facilitate the integration of variable energy resources. Virguez is designing quantitative tools that support the process of assessing policy and market approaches, promoting an increased penetration of variable energy resources in the energy matrix.